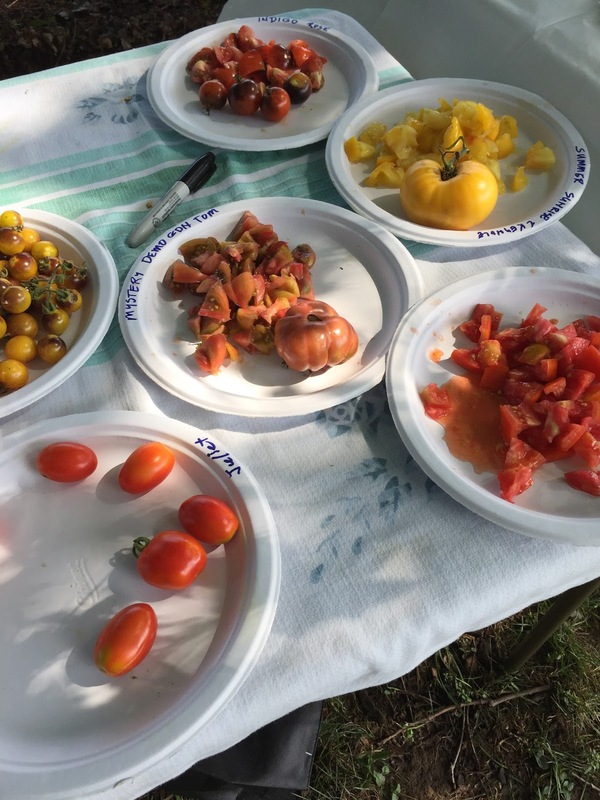 The MGs at the Derwood demo garden have our own tomato tasting on a Tuesday in August, just for those gardeners who show up on that workday. 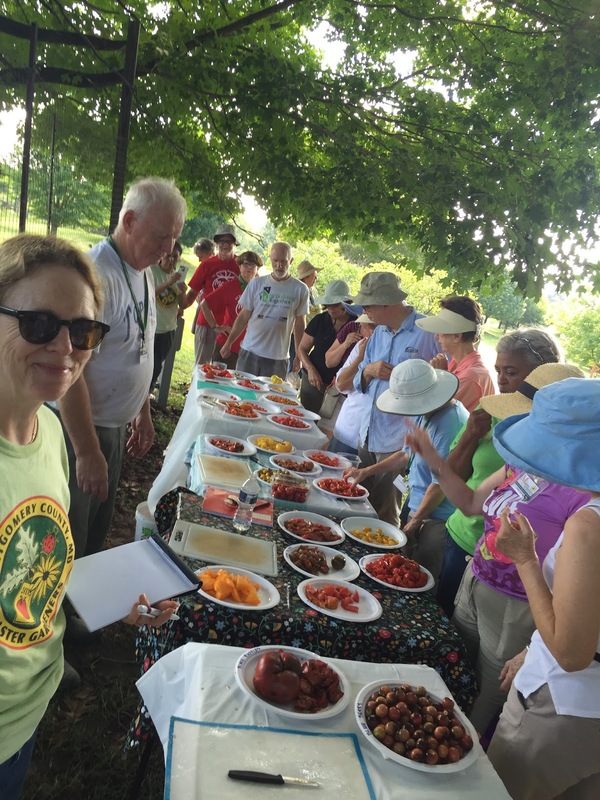 It’s not as big an organizational challenge, or as formal, as the terrific GIEI open house tomato tasting (or the upcoming Washington Gardener event in Silver Spring), but it’s fun for us and a chance to show off what we’ve been growing at home and in the demo garden. 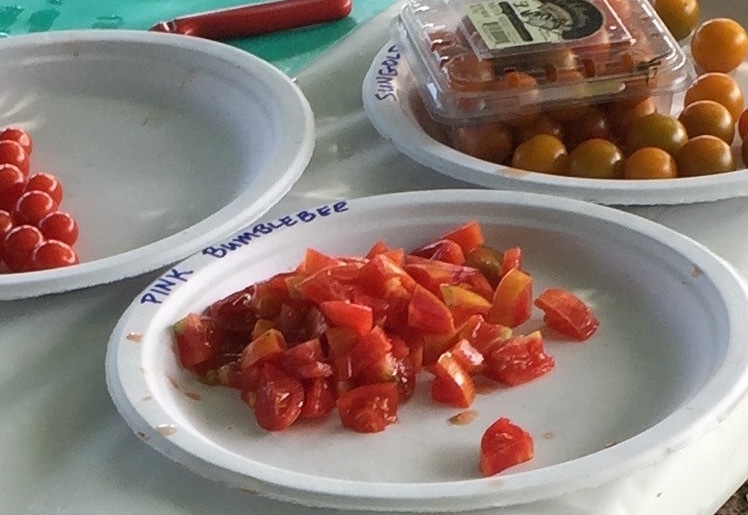 It’s pretty easy to pull together a tasting like this if you have a group (community garden, garden club, neighborhood association) that has a bunch of tomatoes to share and can meet together at one time. Necessary materials include tables (the more the better, we find, so that folks aren’t crowded in and there’s lots of space for the tomatoes) with tablecloths to minimize cleanup, paper plates and Sharpies to label them with, cutting boards and knives, toothpicks, hand wipes or soapy water and cloths, and a few volunteers to do the slicing (just in advance of the tasting lineup) plus one person to tally votes. You can organize the tomatoes by type if desired, and decide how you want tasters to vote – division by color worked well for us, but slicers/cherries/paste would also work. Leftover cut tomatoes can go into a nice salad! Also make sure that people bringing tomatoes label them. Of course it helps if they’re labeled properly in the garden to begin with – you can see a Mystery Tomato in an above photo, from the demo garden, so oops, and one year we had the amusingly labeled “If I Told You I’d Have To Kill You Tomato.” But so it goes. 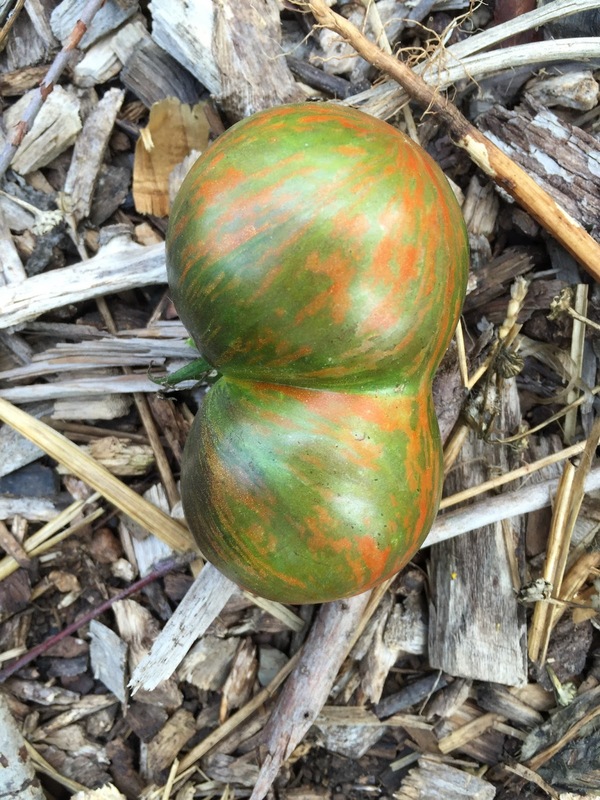 My own tomato season is going pretty well. I’ve heard varying reports from others, including people who have had absolutely no ripe tomatoes to this point (which may have to do with the heat, since ripening is difficult in 85F+ temperatures. I suggest harvesting early, at “breaker” stage (tomato just blushing color), and letting them ripen indoors – also helps with those thirsty birds and squirrels taking bites). Since we had such a chilly wet May I put my plants in on the late side, which helped them avoid fungal diseases for a while (septoria and early blight are pretty rampant at this point), and got the first ripe fruits in the third week of July, later than usual but not unreasonable. and offer a nice contrast in taste, the Apricot being bright and acidic while the Berries are sweet and mild. 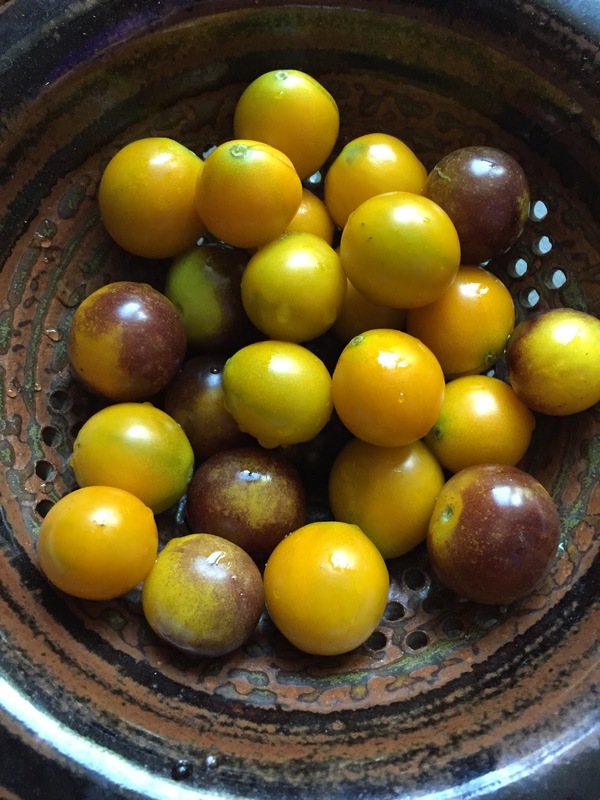 And I’ve had reliable and pretty good tasting fruit from Garden Gem and Garden Treasure, two new (and not commercially available) tomatoes from the University of Florida, which you can get seeds of for yourself with a donation if you like being ahead of the crowd. Which tomato varieties are successful in your garden this year? Let us know!